Get off the couch and boogie to an all-new beat in this singing and dancing game. 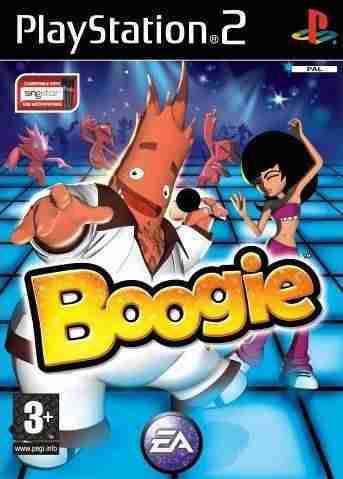 Create and customize your very own Boog, and then take the stage to become a star, using the PS2 controller and a peripheral microphone to showcase your best singing and dancing moves. You can also use the fun and intuitive Boogie Video Creator to produce your very own music video, complete with multiple camera angles and cool special effects. With a huge selection of hit songs from over four decades, a variety of lovable characters, and an easy-to-use controller scheme, Boogie is the must-have sing-a-long, dance-a-long party game for players of all ages. Te gustó este juego? pero te interesa descargar mas juegos de PS2 Te invitamos a que pruebes descargar pachitte chonmage tatsujin 13 pachinko hissatsu shigotojin iii, aparte de juegos de simuladores podrás encontrar muchas más como: juegos de aventuras para la PS2 y siempre disponible en nuestro sitio web de GamesTorrent.